Videowalls are simply everywhere. Go to the mall, airport, or auditorium, and there is a videowall. When competing for attention, especially in digital signage, bigger is better. 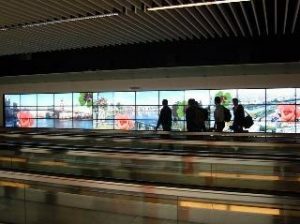 Videowalls are attention grabbers and holders beyond the 4 to 6 seconds we look at smaller images as we pass by. Advertising folks speak about impressions, meaning a viewer sees a message, but videowalls specialize in an additional component, recall. 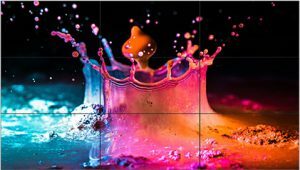 The math is simple: Impression + recall = achieving objectives, and there is no more effective way to meet grand objectives than with a videowall. That being said, a videowall is not just a large matrix of random flat panel displays and all are certainly not equal. In the end it boils down to execution of the concept. I will explain the nuance between success and failure. It should go without saying, the choice of a great videowall display is a must. You should not go down to the local warehouse store and buy a bunch of flat panel displays. A consumer display is simply not appropriate if for no other reason that it has a limited warranty only for consumer use, where commercial displays offers three years’ parts and labor on site. We could also get into other advantages such as product lifetime, duty cycle, RS232 control, IR lockouts, built in videowall processors, etc. but we will leave well enough alone. If you want to learn more – you can take the Digital Signage Display Experts course on the DSEG website. Beyond buying a commercial display, there is the issue of bezel thickness. The holy grail of all videowalls is to appear as seamless as possible; the thinner the bezel the better. A great example of one of the thinnest bezel videowall displays on the market today is the Samsung UD series, with a bezel thickness of 3.5MM screen edge to screen edge. To put that in context, that is the width of the headphone jack on your cell phone. Of course, the thinner the bezel the more expensive the display but in this case, the end justifies the means. Thinner bezels appear more seamless, avoiding distraction for the viewer , thus adding in both impression and recall. That being said, we are not done yet. The often underestimated videowall mount is relegated to an “oh yeah… that” status, and this can be a huge mistake. Consider that it must not only securely mount the display, but also allow you to adjust the seams between the displays, and make sure they stay in perfect alignment, thus avoiding viewer distraction. Keep in mind, the displays cannot be tightly butted up against one another. There must be a small gap so that as the displays heat up, there is room for thermal expansion. Also, don’t overlook the need for quick maintenance. A wall that is down for maintenance is a wall that is not making an impression. Finally, there is the mount design and the efficiency of installing the videowall. Time saved in installation is money saved on a project. 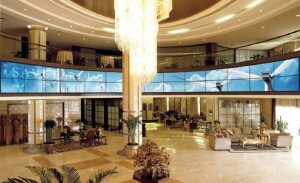 A great example of a videowall mount meeting the above criteria is the Premier LMVS low profile mount. The last part of the equation is the videowall processor. There are the standard on-board processors that provide the basic function of a videowall, taking a single input and expanding it across all the screens. For more advanced applications, there are external processors, like the software based Hiperwall technology that literally performs image manipulation magic. External processors do the seemingly impossible, taking multiple inputs and distributing an array of images across the entire surface of the videowall, without loss in resolution and in any configuration imaginable. Advanced processors can incorporate user video, graphics, and live event streaming at the whim of the operator almost like an orchestra leader with all the instruments at his or her disposal. In the end, a videowall is a tool used to meet an objective. The care in which you select the location of the videowall, the displays, the mount, and the processor combined with “in your face” content will determine the success or failure of the effort. Yes, there is much more than meets the eye! For more content like this, follow Samsung on Insights, Twitter, LinkedIn , YouTube and SlideShare.